Black and white wedding photographs are making a big time comeback. Some like the photojournalistic feeling it gives to an image. Others like the vintage quality associated with fine black and white printing. Some locations just demand that the final image be rendered in black and white for it’s sheer impact. This photograph, I believe, is one of those images. Taken on the grounds of the Horticultural school at SUNY (State University of New York) at Farmingdale the scene just screamed black and white at me. The brilliant deep blue sky in contrast to the white ornamental greenhouse (being illuminated by direct sunshine) renders dramatically in this monochromatic fashion. The bride and groom couldn’t be placed in the direct sunlight, of course. To do so would cause them much discomfort and would result in squinted eyes. 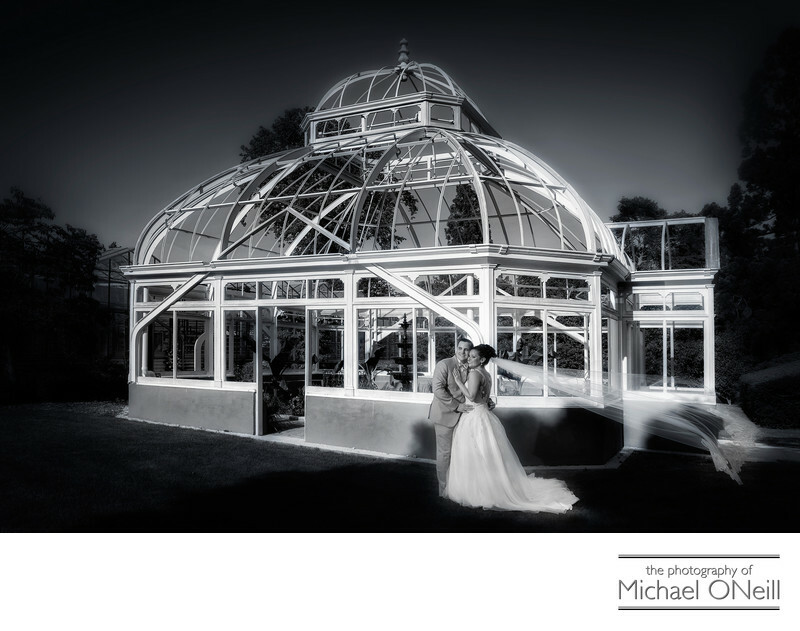 I placed the couple in an area of shade adjacent to the greenhouse and had my assistant illuminate them with a high powered off camera flash. This balanced the light on my subjects faces with the direct sunlight on the structure and creates a totally realistic looking lighting scenario. The veil flowing in the breeze is the handiwork of my second assistant who has been trained to "toss" the veil to give it the appearance of blowing in the wind. All of my images are captured in the camera’s native RAW format which includes all the color information. The conversion to black and white is done in the computer during post production. As a twenty year veteran of working in a "wet" black and white darkroom I have the skillset needed to creat stunning black and white imagery in today’s "digital darkrooms".